It’s 92 years young and a staple of transit cars in the greater Vancouver area. The portable, printed, paper newsletters informing you about the latest in transit trends is now online with The Buzzer Blog. I did a quick blogger profile interview with Jhenifer Pabillano who has been writing The Buzzer since January 2008, and now blogging and podcasting over the last few weeks. Ooh, thatâ€™s a very Nardwuar question. Well, Iâ€™m Jhenifer Pabillano, and I edit the print Buzzer for TransLink. Iâ€™m also the main blogger behind the brand new Buzzer blog. Are you originally from Vancouver? Iâ€™m a mildly recent transplant to Vancouver. I moved from Edmonton to Vancouver in 2004 to get a masterâ€™s degree in journalism at UBC (and I got it in 2006!). The Buzzer is everybodyâ€™s favourite transit newsletter! You can find it on all of the transit vehicles in the regionâ€”bus, SeaBus, SkyTrain, and the West Coast Express. The Buzzer has been around since June 2, 1916, which means itâ€™s 92 years old this year, but it certainly doesnâ€™t look its age (thatâ€™s what I always tell it, anyway). The story behind the Buzzer is that it was launched as a weapon in a long-forgotten war between streetcars and â€˜jitneyâ€™ operatorsâ€”private citizens who patrolled streetcar routes and offered rides for five cents. George Kidd, general manager of B.C. Electric, thought the Buzzer would keep people informed about service and foster rider loyalty to the streetcars. And while jitney service was abolished in July 1918, the Buzzer kept going for another 92 years (and counting!). Over the years, the Buzzer has been a mainstay of public transit. Everybody knows it and remembers it fondlyâ€”I think itâ€™s because the Buzzer was always a light, chatty publication filled with jokes and cartoons. For a long time too, I think it was one of the best ways to learn about local events: Buzzers from the 1950s even ran the movie listings for its readers. Today, the Buzzer still advertises community events as well as bringing our customers the latest in transit news. What is the Buzzer blog? What is the purpose of the Buzzer blog? 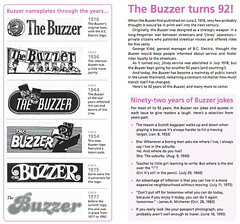 The Buzzer blog is the web companion to the Buzzer newsletter, and launched on October 6, 2008. We started a blog for the Buzzer for a few reasons. First, it helps us reach those who tend to get their information online rather than in print. Another reason we started a blog is to get transit news out much more frequently. We can run key news and updates every day or more instead of waiting every two weeks to print a Buzzer. Online, we can also start publishing things that wouldnâ€™t usually make it into the print version, or canâ€™t be showcased in the newsletter format. For example, Iâ€™ve already posted a video interview with Spirit of the West, and two podcasts with the voices behind the SeaBus and SkyTrain. You could never do that with our print Buzzer! And last but definitely not least, a blog lets us open up a two-way conversation with our customers. Every blog post has a comment function and our e-mail address is readily available in the sidebar. Weâ€™re really, really looking forward to hearing from everyone and having a constructive discussion about our transportation system! Do you have to be seriously into transit to enjoy the site or is it informative to all in the region? Just like the print Buzzer, the Buzzer blog is written for a general audience. Really, weâ€™re looking to keep everybody, not just transit buffs, informed about whatâ€™s going on with the transportation system. But that doesnâ€™t mean we wonâ€™t have items for transit fans on the blogâ€”there will definitely be items for transit enthusiasts every now and then! The central focus is just to make sure that any customer could happen upon the blog and feel welcome there. What is your favourite part about writing the Buzzer blog? Being more colloquial in my writing style. As well, editing podcasts together is a lot of fun along with meeting all the people who are involved in the transit system and hearing all the feedback from everybody. Check out The Buzzer Blog and listen to their latest podcast, featuring the voice of the Skytrain announcements.